●The renowned national artist Paco Osuna alongside Guti and Los Suruba are the last names announced on the line-up in which already includes Nicole Moudaber, Cuartero, Technasia and Dennis Cruz. ● On Saturday 25th of August Hierbabuena beach will welcome the emblematic Thai party for its edition in Spain. Every full moon since 1988 thousands of people from every corner of the world meet up on the beach of the Thai island Koh Phangan to celebrate which is one of the most legendary and known parties in the world, Full Moon Party. In 2018, for its first time in its history, the emblematic event arrives to Spain. The celebration of this Full Moon Party´s first European edition will take place on Saturday 25th of August in Hierbabuena beach. Located in Barbate´s outskirts, in the middle of the Natural Park La Breña and Las Marismas, this beach is one of the most visited in the Spanish coast thanks to its marked contrasts. During the 12 hours, from 18:00h to 06:00h, the audience will be able to enjoy the performances of mega international line artists. Nicole Moudaber, Cuartero, Technasia and Dennis Cruz were recently announced on the line-up, and now other names have also been added. Paco Osuna, the Spanish artist with the most international recognition with 20 years of an impeccable trajectory behind him, will play an unprecedented b2b with Nicole Moudaber; Guti, one of the most powerful Argentinian artists capable of combining Jazz, Merengue and Salsa with Techno; and Los Suruba, Delmar and Alvaro´s project of fresh style and great skills that has seen their works released on Noir, Darkroom, Time Has Changed and Sincopat. To his excellent musical schedule we must add the rest of activities brought by Full Moon party: UV face and body paint, a team of make up artists, free flower Lei necklaces, giant zip lines, performers, fire shows and giant Buddha statues. 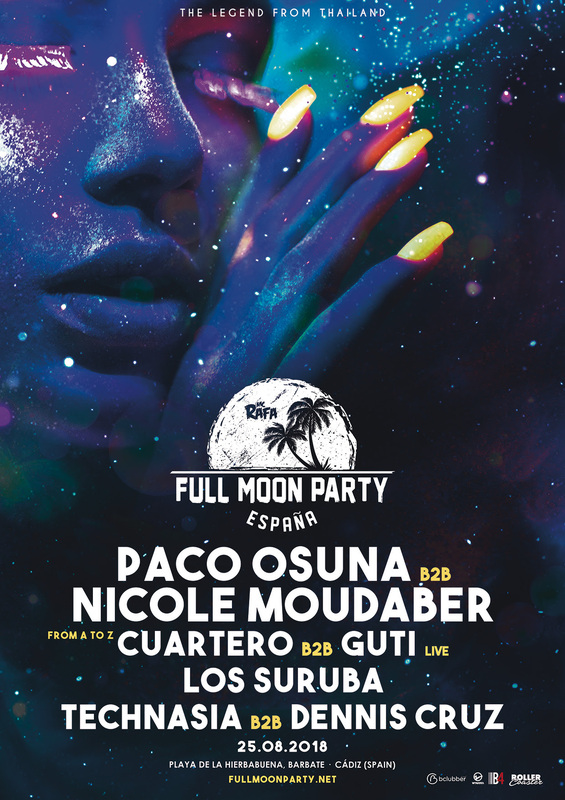 Don´t wait any longer and get your ticket, the full moon is waiting for you! It is our mission as people and as commercial entity to do our utmost to care for the environment and to encourage it´s protection. We believe it is our generation´s greatest cause. Organisers will coordinate with relevant authorities to ensure that there is 0 impact on the environment as a consequence of holding the event. To guarantee this, there will be sufficient clean up crews to be arranged during and post event, proactive policies such as no glass to be served, and/or the use of biodegradable plastics, as well as ample placement of garbage bins throughout the event and eco friendly portable toilets. There are different kind of tickets and their prices will increase as they sell out so get in quick! € 500 + b.f – Máximo 5 people per table. Includes: 2 x 75oml bottles of standard spirit of choice & mixers + exclusive, seated reserved area in raised VIP section + Free UV face & body paint + flower necklace on arrival. For larger groups multiple tables can be purchased.